That brings us to the end of our LIVE coverage. What a day it has been! Siddharth Desai got the highest bid of Rs 1.45 crore whileNitin Tomar was the second player to cross the Rs 1 crore mark as Puneri Paltan retained him for Rs 1.2 crore. Rahul Chaudhari's stay at Telugu Titans came to an end as he was snapped by Tamil Thalaivas for Rs 94 lakh, while the most expensive player in PKL history, Monu Goyat had to settle for a price tag of Rs 93 lakh. Rishank Devadiga too had to settle for a pay cut after he was purchased at just Rs 61 lakh by UP Yoddha. Sandeep Narwal attracted a whopping Rs 89 lakh sum, but another highlight of the day was Esmaeil Nabibaksh who went for a price of Rs 77.75 lakh to become the second-most expensive foreigner in PKL history. Sukesh Hegde and Tushar Patil also go UNSOLD and that's the end of Day 1. Teams will go again for Category C and D players tomorrow. DHARMARAJ CHERALATHAN IS UP NEXT! SOLD! Shrikanth Jadhav retained by UP Yoddha for Rs 68 lakh! No return to the Titans for Rahul who don't have a FBM card But, Ajay Thakur and Rahul Chaudhari in the same team! What a prospect! Last time's most expensive player has to take a pay cut, but Rs 93 lakh is no low amount. NITIN TOMAR retained by Puneri Paltan for Rs 1.2 crore! NITIN TOMAR GOES PAST 1 CRORE MARK! Siddharth Desai becomes second most-expensive player in PKL history after Telugu Titans purchase him for Rs 1.45 crore. U Mumba do not retain him! Bidding for Siddharth Desai crosses Rs 1 crore mark. Pune lead with Rs 1.22 crore bid. Can he break the record? SOLD! Chandran Ranjit retained by Dabang Delhi for Rs 70 lakh! Domestic Category A Raiders up next! SOLD! 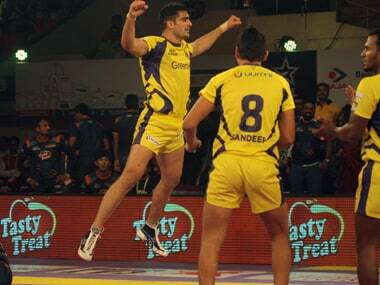 Parvesh Bhainswal retained by Gujarat Fortunegiants for Rs 75 lakh! SOLD! 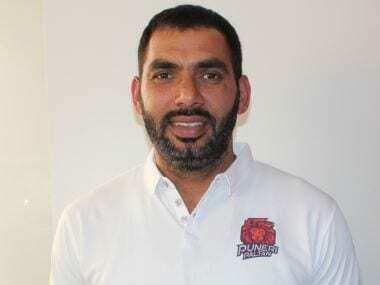 Mahender Singh retained by Bengaluru Bulls for Rs 80 lakh! That was quick. Some quick raises but all in vain as Bengaluru use their FBM card. Many would think this is quite a high price but Mahender was one of the best defenders in the league last year! Gujarat win the bid but Patna use their FBM. Great buy for a very low price. The Pro Kabaddi Season seven auction will take place on the 8th and 9th of April 2019, where 12 franchises will battle it out to add some of the best kabaddi talents in the world to their team’s rosters for the upcoming campaign. With stars such as Rahul Chaudhari, Rishank Devadiga and Abozar Mohajermighani up for grabs, the action in the auction room promises to be intense. The purse for each team has been raised to ₹4.4 crore and the teams will be expected to sign a minimum of 18 players and a maximum of 25 to their roster. Teams that have already exercised the ‘Elite Retained Players’ option to keep hold of a maximum of four elite players will have two Final Bid Matches at their disposal. The Final Bid Match option will allow franchises to match the highest bid received for a non-retained player who played for their franchise in season six and continue their association for season seven. Each team is also required to have a minimum of two foreign players and a maximum of four in their roster for the upcoming campaign. Once again, the Pro Kabaddi auction will feature the ‘Future Kabaddi Heroes’ graduates, who will enter the pool under the ‘New Young Players’ category. Teams will be allowed to pick up to six players from this category for the upcoming campaign. With the aim of building squad continuity, the league has introduced a new category called ‘Retained Young Players’, under which the teams can retain players previously picked from the new young players' category after the player has completed two campaigns with the franchise. With several world-class and upcoming talents to choose from, teams will be certain to bid big for the players that they believe will present them with the best chance to capture the Pro Kabaddi crown. The action in the auction room will undeniably be the precursor and set the precedent for the upcoming campaign.